Annual rental in Downtown Sarasota: This luxurious 2 bedroom, 2 bath with den residence is available in the One Watergate building. 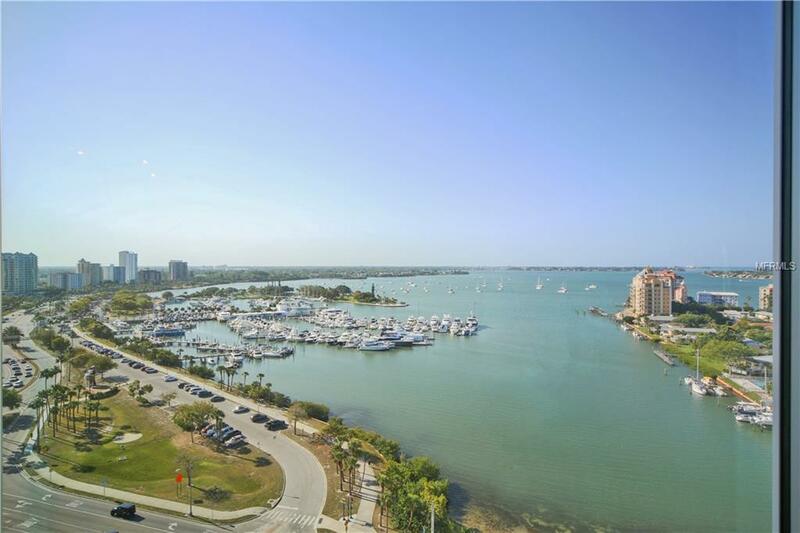 Located on the 17th floor, each room offers spectacular panoramic views of the Sarasota Bayfront and the gulf beyond from the new floor to ceiling windows. The master suite features a Queen sized bed, large walk in closet and an ensuite which has a shower and a large soaking tub with jets. The second bedroom offers two twin beds as well as a large closet. The guest bathroom has been remodeled with a gorgeous marble walk-in shower as well as new fixtures. The condo is beautifully upgraded with porcelain floors throughout. The kitchen features wood cabinetry, granite countertops and back splash along with top of the line stainless steel appliances, Sub-Zero Refrigerator, Wolf Stove and Microwave and Bosh dishwasher. One Watergate has recently undergone a major renovation featuring all new hurricane resistant windows, sliders (very quiet), new balcony, glass railings, lobby renovation, exterior painting and a brand new heated saltwater pool, plus 2 outdoor grilling areas. The building is secure, has covered parking and onsite management for convenience. Located in the heart of Downtown adjacent to the Ritz Carlton, easy access is yours to all of the world-famous dining, theater, opera, entertainment, beaches, and shops that Sarasota has to offer. This condo comes turnkey furnished and is ready for immediate occupancy with association approval. No pets please.